My husband raised his left arm all the way up, above his head, yesterday. His therapist took a video of him on his iPhone and emailed it to me while he was at rehab. As I watched it, I was reminded that three months ago, he could not move that arm at all. He's also walking much quicker now. When he came home from the hospital in mid-July, I had to spot him walking up and down the stairs. It was a slow process. But now, he'll tell me he's coming upstairs, and I figure I'll see him in two or three minutes, only to turn around 20 seconds later and see him clearing the last step. He seems to have made tremendous progress in particular the past two weeks. Our prayers are being answered. Although I'm still incredibly busy, I did get a chance to sew a few weeks ago. This hour of time happened to coincide with my realization that there was an alternative to changing Niko's shirt five times a day - drool bibs! Most of you probably had that figured out with your own babies, but in my house, bibs had always been mealtime attire. So one evening after dinner, I disappeared downstairs, tossed through the scrap bins and sewed up a bunch of bibs. These are just the ones that were clean today. A few more are in the wash, and I have another half dozen in the sewing cave in various stages of assembly. I need to finish them as Niko can go through four or five of them on particularly wet days. I looked up a few tutorials to see how big to make them. The measurements varied from 11" squares (cut in half) to 14" squares. I made a few of each since I didn't know what would work. They all do - though he will outgrow the 11" ones sooner. I used a bunch of different fabrics - linen, double gauze, flannel, quilting cotton and corduroy. I'm really liking the ones that are flannel on one side and corduroy on the other - they seem to last the longest before soaking through the back. I'm happy to see some of my favorite plaids around his cute little neck. And Niko is happy to have a dry chest (mostly). There was a Hancock Fabrics on the road to the hospital where my husband spent four week in acute rehabilitation. There aren't any Hancocks near me, so I took the opportunity, when I was driving back and forth nearly every day, to stop in a few times. I liked their selection of apparel fabrics a lot more than the selection at my local Joanns, though that may be a case of the grass being greener at the other fabric store. 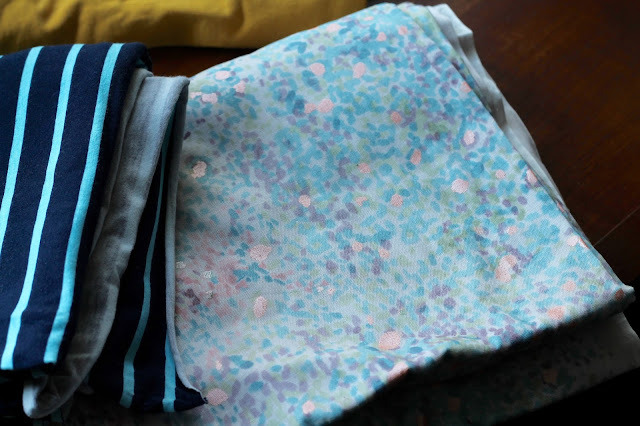 In any case, it was love at first sight for me and this rayon print. I have a thing for bright colors on a navy background - this fabric reminded me quite a bit of a navy Asian-inspired print I bought when we lived in Moscow. I used that fabric to make these two Ice Cream tops for my girls (they were 18 months and 2.5 years in this photo!). While I was shopping at Hancock, I also spied New Look 6374. Mandarin collar? Front and back yokes? Front placket? Yes, yes and yes please! But despite all of those yeses, this top never gets worn. The main problems are a) the shoulders are too wide and b) the armholes are too low. 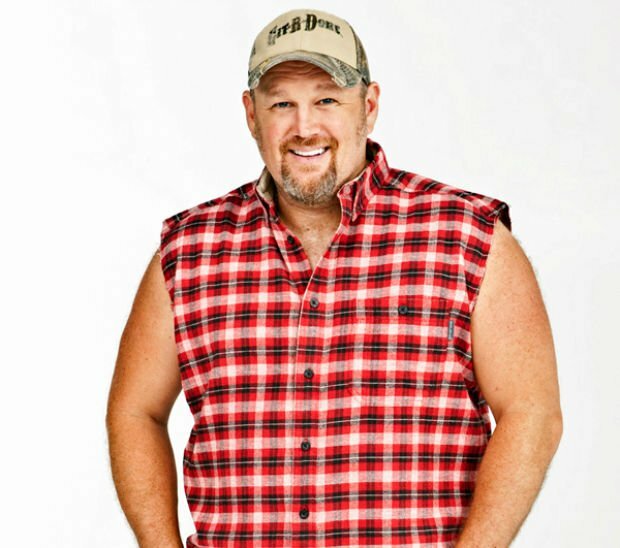 The width of the shoulders and my fluffy upper arms make me think of Larry the Cable Guy every time I put this on (only to take it off again, having confirmed that it really doesn't look good on me). I think the top would be more flattering if it showed a little more shoulder. It's not an issue of me cutting a smaller size - I had already cut a 14 shoulder according to my high bust measurement. The pattern builds in a whopping 8" of bust ease, which seemed excessive. So I just widened the pattern to a 16 at the bottom of the armscye (for 5" of ease at the bust). In any case, fixing the Cable Guy shoulders isn't a hard fix - the armholes are finished with bias tape, so I'd only need to pick that out and then cut some width off the outer shoulder before rebinding - I just need to find time to do it. But there is no fix for the low armhole. It is bra city down there. Though as it turns out, the placement of the white flower on the pattern and my light-colored bra means that it's not that noticeable unless you're all up in my armpit. No one ever is except Niko, though, and he doesn't care if my bra is showing. 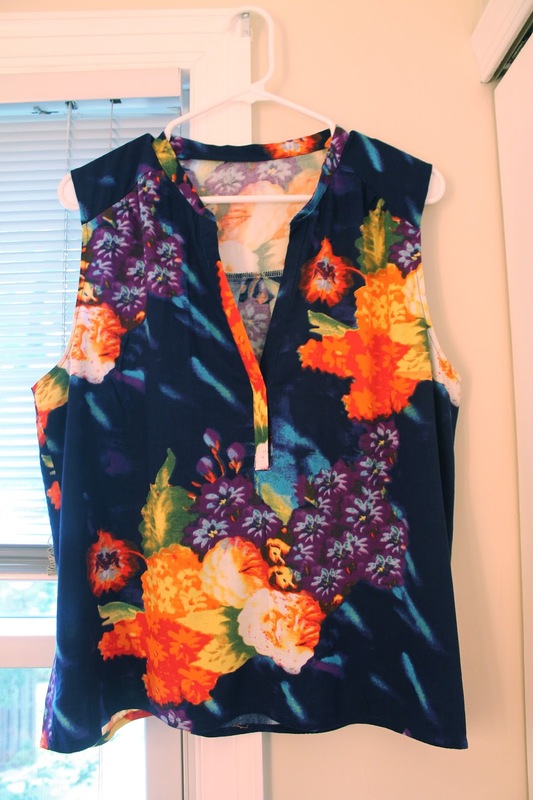 The top features front and back yokes with gathering where the bodice meets the front yoke, and a pleat in the back. I did not use a contrasting fabric as suggested for the front yokes, so they get lost in this big print. The top of the bodice did not gather as much as I thought it would based on the line drawings. The gathering gets lost in the print too. While the end result has me thinking that this shirt was not the best use of the big print (which would may have been better suited to a simple tank top that did not break up the pattern), my choice of substrate was spot on. I don't think I would want to wear this top made up in anything less drapey. I should have done a forward shoulder adjustment. It's been so long since I've sewn myself a woven top that I had forgotten that I really always need a forward shoulder adjustment. Otherwise I am constantly shrugging my clothing forward. 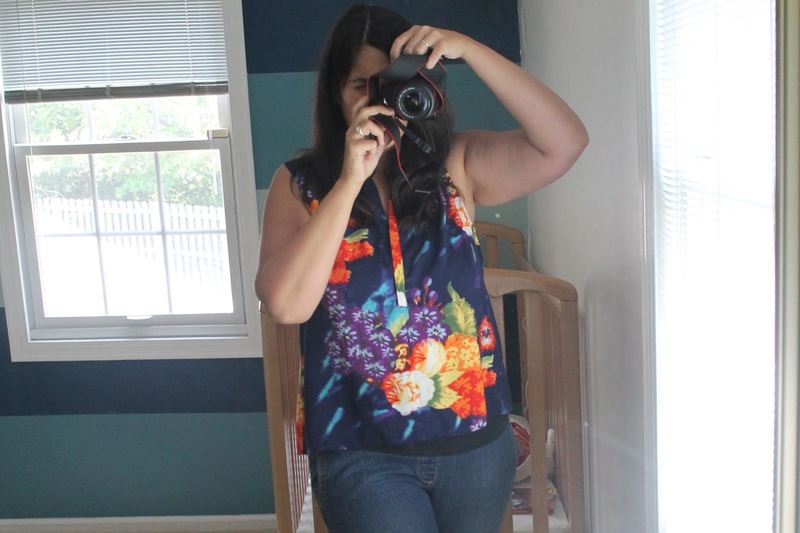 And finally, the shirt is just a bit short (yes, that is the waistband of my maternity jeans in the photo above ...). All that said, the actual sewing of this pattern was very pleasant. The placket and mandarin collar are very well drafted and the instructions throughout are quite thorough. The pattern recommends French seams, which I forgot to do, but I imagine the inside finish would be very nice if I had done them. The yokes are unlined and I used my serger for all seam finishing, so my insides aren't as nice as they could be. I would consider trying this again, redrafting the armholes to fix the depth and the shoulder issue, and lengthening it a smidgen - maybe 3/4". But who knows when I will find time. 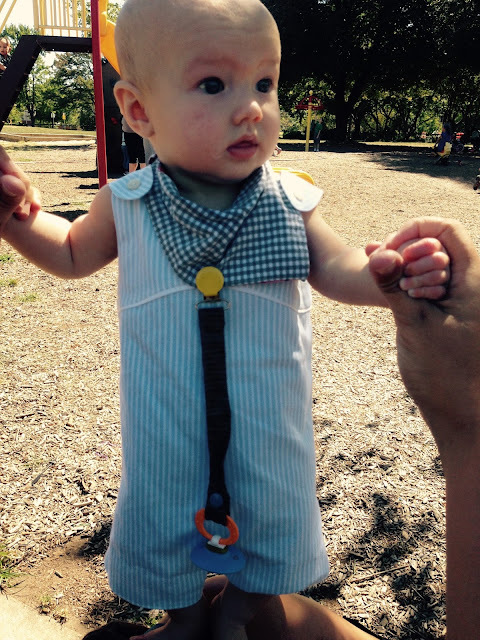 I sewed this a couple of months ago and all I've had time for lately are baby drool bibs.